Here’s the second of my Ground Beef recipes, and it was hard to choose. Last time I included a great breakfast/supper recipe with the Ground Beef Omelets. Today I wanted something simple, an “all in one” meal. So I have something easy, tasty, and nutritious. How does having your grains, veggies, and protein all in one awesome package sound? Thank you Elizabeth H (Twitter) for submitting this great recipe. I’ve had something similar, but never tried it with the pepper whole. Mine turned out juicy and delicious. I like my pepper with a little crunch left to it and used some shredded Colby jack cheese, instead of mozzarella, because it was in my fridge. Cut the tops off your bell peppers and remove the guts. Set these in a 9×9 baking dish. In a skillet, brown the ground beef. Add the salt, pepper, chile powder, W sauce, and T sauce to cook in the flavor! Dump in the can of rotel and tomato sauce. Cook this on low heat while you prepare the rice according to the directions on the box. Mix the rice into the sauce. Give it a taste, and add more seasoning if necessary. 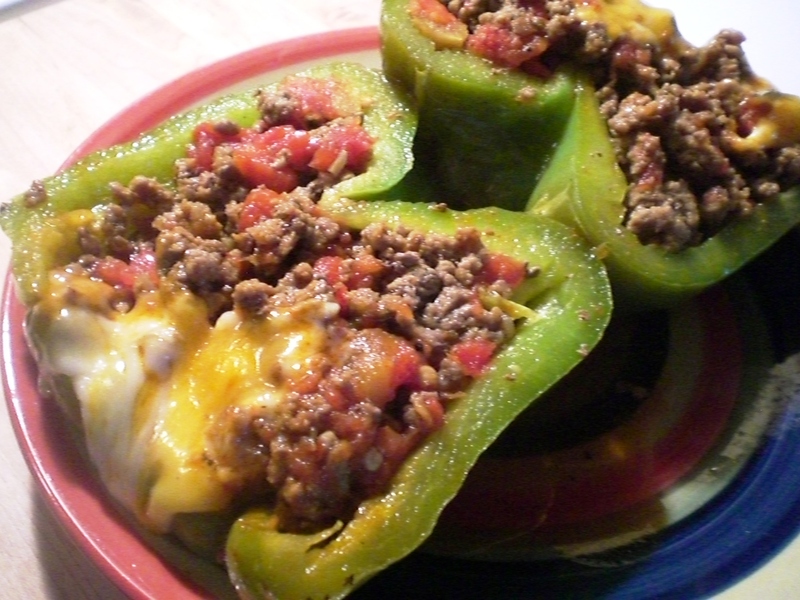 Spoon the contents of the skillet into the bell peppers, pack the leftover beef mix around the outside. Cover with foil and bake 350 for 20-30 minutes or till the peppers are as tender as you like. Remove foil and sprinkle with cheese. Bake 5 minutes or till cheese is melty and wonderful. Let me know if you try it and what you think. One more recipe winner on the way, so stay tuned! Remember to thank the farmers and ranchers that worked hard to produce the food found in this recipe!